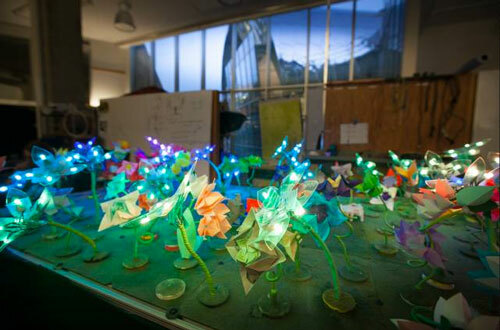 (Nanowerk News) Here’s one way to get kids excited about programming: a "robot garden" with dozens of fast-changing LED lights and more than 100 origami robots that can crawl, swim, and blossom like flowers. 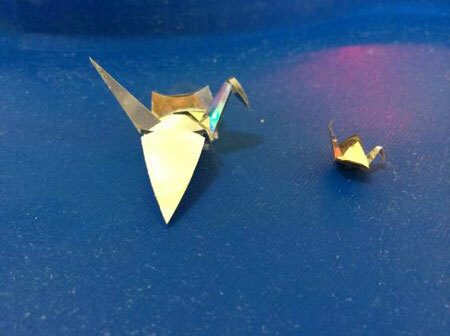 A team from MIT’s Computer Science and Artificial Intelligence Lab (CSAIL) and the Department of Mechanical Engineering have developed a tablet-operated system that illustrates their cutting-edge research on distributed algorithms via robotic sheep, origami flowers that can open and change colors, and robotic ducks that fold into shape by being heated in an oven. In a paper recently accepted to the 2015 International Conference on Robotics and Automation (ICRA), researchers describe the system’s dual functions as a visual embodiment of their latest work in distributed computing, as well as an aesthetically appealing way to get more young students, and particularly girls, interested in programming. The system can be managed via tablet or any Bluetooth-enabled device, either through a simple “control by click” feature that involves clicking on individual flowers, as well as a more advanced “control by code” feature where users can add their own commands and execute sequences in real-time. Each of the system’s 16 tiles are connected via Arduino microcontrollers and programmed via search algorithms that explore the space in different ways, including a “graph-coloring” algorithm that ensures that no two adjacent tiles ever share the same color. Among the other researchers on the new project were PhD candidate Joseph DelPreto, postdocs Ankur Mehta and Shuhei Miyashita, and members of MIT Professor Sangbae Kim’s Biomimetics Robotics Lab, including undergraduates Debra Ajilo and Negin Abdolrahim Poorheravi. Kim’s team developed eight distinct varieties of origami flowers — including lilies, tulips, and birds of paradise — which are embedded with printable motors that he says “allow them to blossom in very interesting ways.” The sheep robots were created via traditional print-and-fold origami techniques, while the magnet-powered ducks started as two-dimensional paper prints that were heated in an oven, causing them to automatically fold into shape. The Robot Garden is a system that functions as a visual embodiment of distributed algorithms, as well as an aesthetically appealing way to get more young students, and particularly girls, interested in programming. Sanneman and DelPreto showed off the current garden to local schools at CSAIL’s “Hour of Code” event in December, and say that they plan to incorporate it into a programming curriculum involving printable robots that they have developed for middle and high schools. In the future, they also hope to make the garden operable by multiple devices simultaneously, and may even experiment with interactive auditory components by adding microphones and music that would sync to movements.